Ugandan MPs have passed a controversial bill limiting public protests - branded a "serious blow to open political debate" by Amnesty International. The Public Order Management bill was passed despite fierce criticism from religious leaders, opposition MPs and the public as well as rights groups. Police approval will now be required if three or more people want to gather publicly to discuss political issues. Supporters insist the bill is not insidious but practical. Amnesty says the bill is part of a pattern of repression, pointing to the closure of two newspapers and two radio stations in the country in May 2013 for reporting on an alleged government plot to assassinate opposition MPs. The public order bill was initially proposed in 2009 and was finally passed following months of bitter debate in and outside parliament. It was approved by parliament, dominated by President Yoweri Museveni's National Resistance Movement (NRM), despite protests inside the chamber and following impassioned attempts by opposition MPs to filibuster proceedings. The bill gives the police discretionary powers to veto gatherings of as few as three people in a public place to discuss political issues. Police can also break up meetings of three or more people discussing political issues in their own homes. Police must receive written notice of public meetings seven days in advance and they may only take place between 06:00 and 18:00. They are entitled to turn down requests on grounds that the venue is already being used, is considered unsuitable or "any other reasonable cause", the bill states. The bill also allows police to use firearms in self-defence, in defence of others or against those resisting arrest. President Museveni's supporters and police say the bill is simply a practical measure to allow the regulation of protests - preventing them from turning violent, disrupting businesses, or even resulting in deaths, reports the BBC's Catherine Byaruhanga in Kampala. It will "protect people's interests", said NRM MP Moses Ali. "We have as much as possible tried to accommodate the views expressed by the opposition as well as what the public thinks," he told news agency AFP. 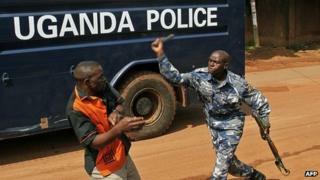 But critics say the bill represents an attempt by Mr Museveni - who seized power in 1986 - to silence dissent. "It is a bad law which restricts freedom of speech and expression and hinders democratic values," independent MP Moses Kasibante told AFP, saying it would be challenged in the constitutional court. "We have resolved to challenge it in the courts of law because it is against the constitution of Uganda." "This bill represents a serious blow to open political debate in a country where publicly criticising the government is already fraught with risk," said Sarah Jackson, Amnesty International's deputy Africa director. "The Ugandan government must stop trying to crush the rights to free speech and peaceful demonstration as enshrined in its own constitution as well as international law." Opposition leader Kizza Besigye has been arrested numerous times in recent years for trying to organise street protests over the cost of living. The country has also attracted international condemnation for draft legislation proposing increased penalties for homosexual acts, which are illegal in the country.